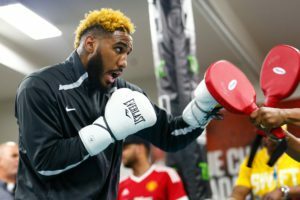 Jarrett “Swift” Hurd (21-0, 15 KOs) showed no hesitation in accepting a unification bout with the considered most established and experienced champion in the Jr. Middleweight division against Erislandy Lara (25-2-2, 14 KOs) this Saturday at the Hard Rock Hotel and Casino in Las Vegas. Hurd relished the opportunity and is heading into the biggest fight of his career with supreme confidence that not only will he defeat Lara, but also establish himself as the only unified champion in the talented rich 154 pound division and make a strong argument that he is the best Jr. middleweight in the world. “This is going to be a difficult fight. Lara is the type of fighter who has a lot of experience. It won’t be easy so I have to be well prepared and on top of my game come Saturday night,” Hurd said. Hurd has on been on a tear as of late which can explain the supreme confidence he has heading into this bout. Over the past 7 fights, Hurd has recorded 7 consecutive crushing knockouts, including an impressive stoppage win over former world champion Austin Trout in his last outing. It’s only fitting that for his first unification bout, Hurd will be back at the same arena where he first gained notoriety in his impressive knockout win over the previously undefeated Frank Galarza almost 3 years ago. “Being back in Vegas and back at Hard Rock where I beat Frank Galarza to really get this whole journey started means a lot to me. I’m planning to give everyone a great show just like I always do,” Hurd told the boxing press. Despite a limited amateur career, Hurd is only a slight underdog to the more experienced champion in Erislandy Lara. Lara has fought by far the much better opposition, but his career has stagnated since his close decision loss to Canelo Alvarez back in 2014. Lara has since made 5 successful defenses of his WBA strap since then, but inactivity and fighting some unworthy opponents has made his WBA title run very lackluster. The word in Vegas is that Hurd will be too big, too strong, and too fresh for Lara, but whatever happens this Saturday, Hurd promises action in this Jr. Middleweight unification. “It’s always going to be fireworks when I’m in the ring. I have a fan-friendly style. At the end of the day, you don’t have to worry about Lara running away, because I’m going to be in his face for 12 rounds,” Hurd said.